Covers Hamsterley Colliery, Ship Inn, Pickle Bank Wood, Hagg House, Derwent Cote House, Peartree House and Methodist Church. Covers Crookgate, Sheep Hill, Bryan's Leap, Leazes, Lintz, Burnopfield Colliery and Lintz Colliery. Covers Shotley Bridge Railway Station, Shotley Park, Medomsley Crossroads, Pretoria Club, Shotley Lodge and Home for the Aged and Infirm. Incl Dipton, Collierley, much of Pontop, Pontop Hall, South Medomsley Colliery, Delight Colliery, Dipton Colliery, St John's Church. Double-sided to cover the Blackhill area of Consett including Benfieldside Cemetery, St Aidan's Church, Bell's Wood, No.1 Farm, Railway Station and Consett Park. Covers Redwell Hill Quarry, Low and High Brooms, Bradley Shops, Billingside Plantation, Carrhouse Station and St Ives' Church. Covers the Steelworks, Consett North Junction, Templetown, Delves Brick Works, Christ Church and Consett Hall. Covers Consett Iron Works, Templetown, Infirmary, Consett Hall, Skating Rink, Station, Technical Institute and Fell House. Covers Pontop & Jarrow Railway, old wagonway, Mountsett Fell, Hobson cokeworks, small part of Tanfield, Clough Dene and Tanfield Leith Hall. Covers east part of Tanfield village, also part of Tanfield Railway; incl Causey Arch, East Tanfield colliery, St Margaret's Church, Carrickshill Wood, Beamish Red Row and Causey Hall. 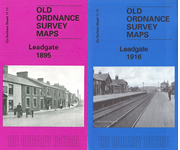 Double-sided map covers Tanfield Lea Colliery, Joiceys Square, St Andrew's Church, Beamish Colliery, Kiphill, South Moor Colliery,Stanley Hall and Shield Row. Covers Shield Row, East Stanley, Tanfield Lea Colliery, Beamish Colliery and Shield Row Station. Covers Pit Hill, Beamish Station, St Pauls Church, Beamish Stables, Forgebank Plantation and Beamish Colliery. Covers Pelton village, High Urpeth, Urpeth, Perkinsville, part of Ouston, Urpeth colliery, Urpeth South Farm, Holy Trinity Church and Cemetery. Covers South Tanfield Colliery, South Moor Colliery, West Kyo, Part of Catchgate, Lizzie Square, East Kyo and Quakinghouse Cottages. Covers Craghead Colliery, Twizell Wood, Wheatley Green, Holmside Colliery and Ousterley. Double-sided map incl Pelaw House, High Flatts, South Pelaw Colliery, Cemetery, Red Rose Hall, St Mary & St Cuthbert's Church and Union Workhouse. Covers Holmside New Hall, Burnhope Colliery, St John's Church, Fellside PlantationMorrowedge Quarry and South Moor Colliery. Covers Edmondsley Colliery, Warland Green, Mill Wood, Daisy Hill, Nettlesworth North House and Congburn Quarries. Covers All Saints Church, Union Workhouse, High Burnhopeside, Fenhall Bridge, Manor House and Railway Station. Covers Manor House, Railway Station, The Green, All Saints Church, Hospital, Fenhall Bridge and The Nook.